There are desires inside of you that want to destroy you. They will try and lure you to anything and everything except God and his glory. In this lab, John Piper teaches us to fight remaining sin in our own hearts. He end by giving two strategies for abstaining from the passions of the flesh. When the Bible uses a metaphor, in this case war, we need to slow down and ask questions about the specific ways in which the word picture teaches us about the spiritual reality. Every metaphor is limited, but there are often precious things to be seen between the two things being compared (e.g. war and sinful desires) that are not immediately apparent at first sight. 1 Peter 2:11 says that our passions wage war against our soul. Based on the immediate context (and anything else you can think of in Scripture) how do those passions fight? What do they do to harm you? What are ways Christians might misunderstand or dismiss the command in 1 Peter 2:11? How would you help them understand it rightly? 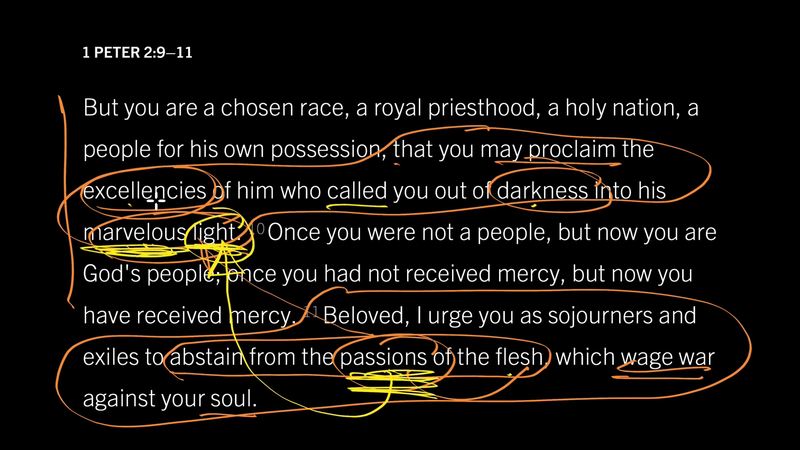 What strategies can you think of from Scripture for abstaining from the passions of the flesh? Where would you take someone wanting to fight sin in their own heart? Some will get this wrong by thinking these kinds of commands are not necessary for believers, because they’ve already been saved. Others will get this wrong by thinking we abstain so that we can be saved. Both are seriously wrong. The text tells us who we are, and then gives us the command (so that we increasingly become who we already are). Those who walk in love and destroy their sin (not perfectly) are showing they have already been made new through faith. 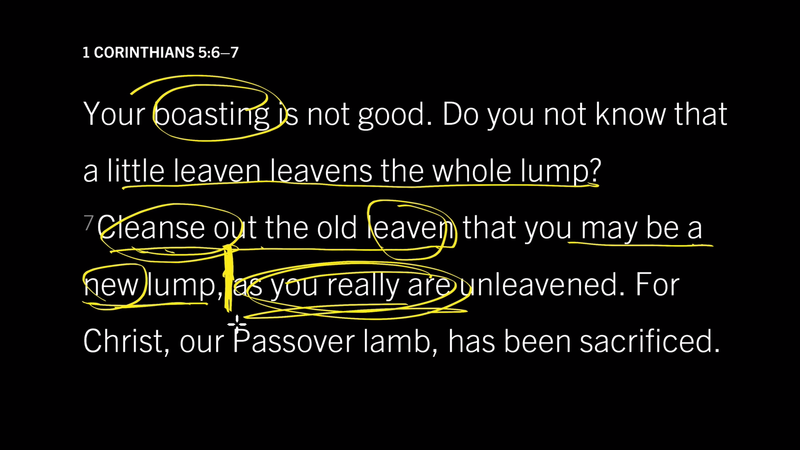 The same pattern shows up in 1 Corinthians 5:6–7. Be about becoming something new, because you already have been made new. 1 Peter 2:9–10 declare who we already, and then 1 Peter 2:11 says how we ought to live in light of that reality. When you abstain from the passions of the flesh, you’re not making yourself God’s chosen people, but revealing that you already are God’s chosen people. The passions of the flesh are any passions that cause you to stop marveling most in the excellency of God (1 Peter 2:11). They dim and destroy your passions for God. The passions of the flesh strip you of the power to do the thing you were created to do: to proclaim God’s excellencies. One option is to “cut off your hand” and “gouge our your eye” (TEXT). You feel the desires, but deny them. As you abstain from the passions of the flesh, you preserve the very reason for which you were created, namely to savor God’s glory.